Expansive is an understatement to describe ePLDT’s VITRO Network of Data Centers as it unveils its tenth data center in the country—its second one in Cebu. In 2000, PLDT and ePLDT began one of its most expansive and formidable projects to date by being the first to put up a purposely-built data center in the Philippines. 18 years later, the country’s largest telecommunications provider has 10 VITRO Data Centers spanning the Philippine archipelago—with established presences in major cities like Makati, Pasig, Clark economic zone, and most recently, Davao, the first in Mindanao. Data centers are physical infrastructures built to store, manage and safeguard mission-critical data from cyber security threats and physical disasters. ePLDT’s latest data center, which formally launched in May 2018, is located in Mandaue. The city produces 75 percent of the country’s total furniture exports and hosts Shemberg, the world’s top carrageenan supplier. Alcoseba at the media launch of PLDT and ePLDT's 10th data center in the country—its second one in Cebu. 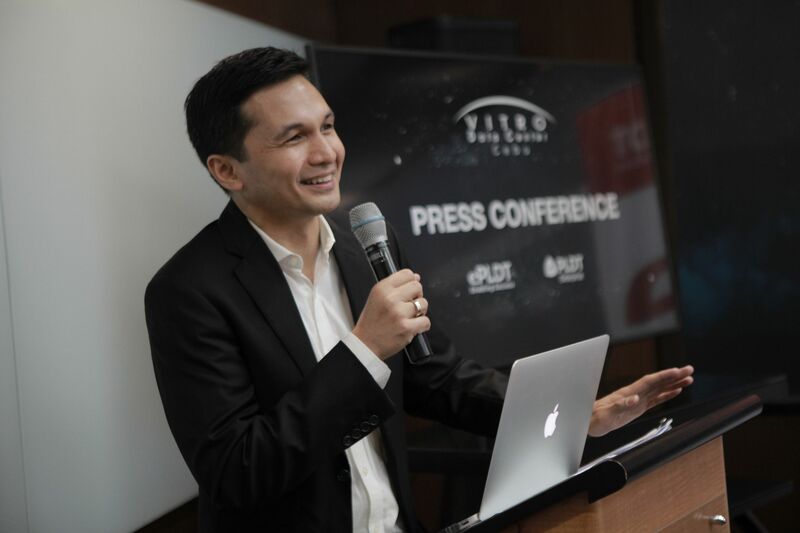 “The Philippine market for data centers has grown immensely over the last three years,” says VP and Head of Disruptive Business Group for PLDT Nico Alcoseba. “In fact, four out of our 10 data centers are already sold out,” he adds. VITRO Cebu 2 is equipped with a maximum of 800 racks, adding to ePLDT’s current 8,350-rack capacity—bringing its total rack capacity to 9,150. Built from the ground up, the latest data center boasts the most up-to-date and globally competitive technologies, including finger-vein scanning features, special CCTV cameras, and 24/7 monitoring and surveillance. “We’ve made sure that all our critical systems such as uninterruptable power supplies, switch gears, and others are fully redundant, so collocated clients need not worry about service interruptions that could temporarily halt business operations. This infrastructure redundancy also allows us to conduct IT maintenance without any disruption on client operations, ensuring that crucial data remains safe, all of which resides behind 12 formidable layers of security," said ePLDT Group’s SVP and Chief Operating Officer Nerisse Ramos at the launch of VITRO Cebu 2. Alcoseba shares that what sets ePLDT and PLDT’s VITRO data centers apart from its competitors lies in three things: technology, expertise, and methodology. “In terms of expertise, ePLDT and PLDT are the pioneers in data centers, and this excellence is unmatched locally. This is further augmented by our spirit of innovation, and our DNA of trying to see how we can improve things not only in terms of infrastructure and platform, but in ways of doing things,” he says. “Our methodologies are differentiators, because we operate according to global best practices. Aside from our ISO certifications, we are also Nexcenter certified.” Nexcenter is the certification program of the NTT Communications Group, which operates more than a hundred data centers across the globe. Alcoseba says that the state of technology and digital enablement in the Philippines has changed immensely since the group first opened their first data center. “The reality is that we now operate in a world characterized by volatility, uncertainty, complexity, and ambiguity. And what that means is that it’s a world with heightened risk, and we have to think of risk in a different way,” he says. “Before, the magnitude of the risk and the probability of disaster striking used to be inversely proportional. Today, the term ‘anything is possible’ has become ‘anything is probable.’ We at ePLDT and PLDT are in the business of ensuring peace of mind, safety, and business resiliency for our clients,” he ends. The second Cebu VITRO Data Center is supported by PLDT’s robust fiber optic network spanning over 187,000 kilometers, enabling the delivery of digital solutions nationwide.